The Littlest Matryoshka is a great book! Several years ago, I was hospitalized for severe asthma. As anyone who has been hospitalized with an illness that does not keep you zonked out will tell you, it is boring! My brother, who lives over 500 miles away could not visit me. Instead, he called me and read The Littlest Matryoshka by Corinne Demas Bliss to me over the phone. I can't begin to describe how special that occasion was to me. He had purchased the book for his daughter years ago. When he purchased the book, it came with a set of Matryoshka dolls. Over the years, his family collected several sets of the dolls, which are shown in the picture at left. When I visited him, he graciously took this picture for me to use with this article. 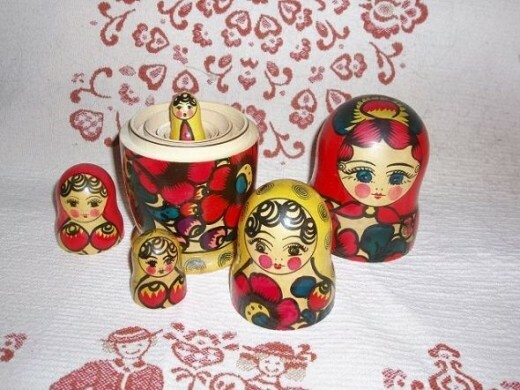 Even as a child, I loved the traditional Russian nesting dolls. The bright colors they were usually painted were so cheerful, and the fact that they all stacked neatly into a larger doll made them fun. I don't know why he chose to read this particular book to me when I was hospitalized, but I will always remember it. It was a very special gift that showed how much he cared, even though he was not able to physically travel to my location. Most children will enjoy the story of a Matryoshka doll created by a Russian craftsman. After the doll is shipped to America to a toy shop, the littlest doll is lost. The book follows the adventures of the littlest doll from the time it is lost to the time it is found again by a very special little girl. Some people think the story line in The Littlest Matryoshka is too obvious, but with 91 commenters and raters on Amazon.com, it has a rating of 4.9. The artwork is colorful and well done. The story is one most children will enjoy, and it gives new understanding of the traditional dolls. 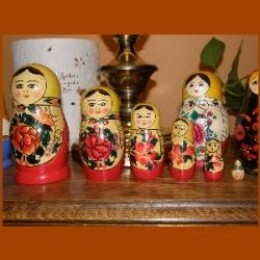 Nesting doll blanks are available for you to make your very own Matryoshka dolls. Sometimes, Matryoshka dolls are referred to as babushka dolls, but this is not correct. A babushka doll is a grandmother doll. Vasily Zvyozdochkin carved the first Russian Matryoshka doll in 1890, based on a design by Sergey Malyutin. The largest, outer doll is usually a woman, but the figures inside the largest can be male or female. The smallest is usually a baby. The painting of the dolls is intricate with bright colors. This process is fascinating to watch! Have you read The Littlest Matryoshka? - Would you recommend it?